Hat-Trick goes online on Tabletopia. PM me if you want a learn, try or play it. Polish game designer and publisher. In 2013 established the "ZGrani" publishing company and released MCS (Moto-Craze Speedway). 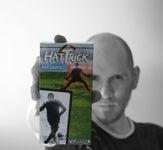 In 2014 established the "Unplugged" publishing company and released his long-time pet project, football card simulation, "Hat-Trick".